The above picture was a cafeteria that used some artificial cacti and succulents to decorate their partition wall. You can use this in a smaller version in your home, whether it's a small pot or a larger project like this. Using mixed succulents is never a bad idea as they all go with each other. Yucca grass, aloe and echeveria will soften the edges a bit and will fill empty space between the more traditional cactus plants. The Sky is the limit when working with succulents as they are so versatile and you can use colors that match your decor. Using reds and purples are a great way to give your room a splash of color without overwhelming the arrangement. If you like a more sparse arrangement try using pea gravel or sand in between the plants to give it a desert landscaped look. I hope this picture inspires all of you and I would like to see some of the pictures of your own special touch or style added to your arrangement ideas. Remember, you really can't go wrong with succulents. Happy artificial planting everyone! To view our huge selection of artificial cactus and succulents click here. 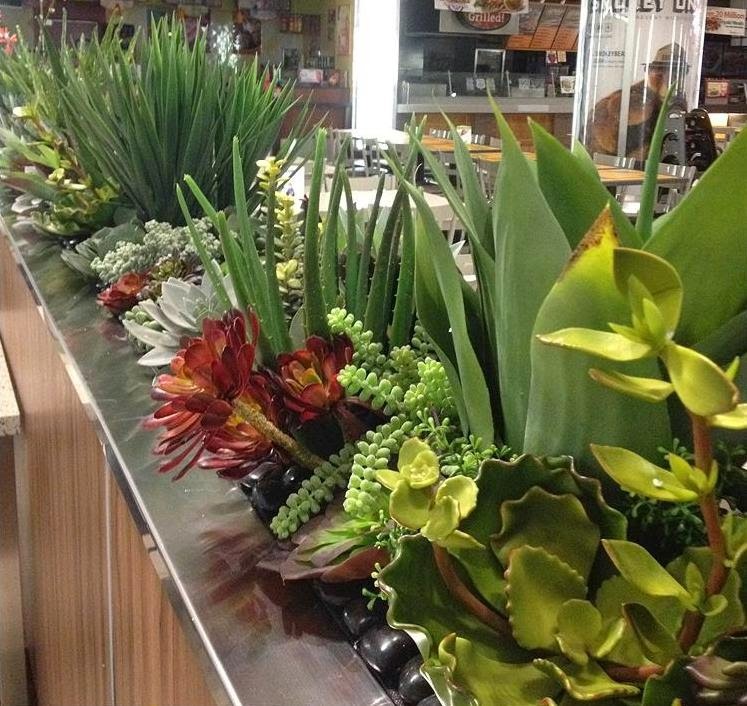 Some of the succulents shown in the picture are: Echeveria, Agave, Aloe, Sedum, donkey tail and kalanchoe.